These are my kids: Tre (10), Tonio (8) & Talia (5). We try to do a group theme every year (we did the Plants vs. Zombies a few years ago). I didn't keep track of the cost, but the most expensive thing was probably the face paint ($17 for a REALLY small bottle, but I needed it water based and safe for kids). I airbrushed on the paint and basically just found white sweatpants and a white dress. The blue bodysuit on Smurfette was found online and the smurf wore a blue shirt. 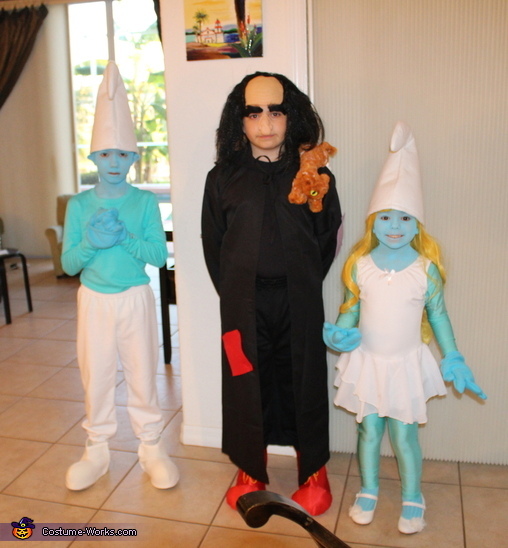 Gargamel wore a black cloak that we attached patches and the cat, Azrael, to. We used a prosthetic nose and he wore the skull cap and wig. The smurfs tail was a blue makeup sponge. So many people stopped to take pictures with them this year. Happy Halloween!